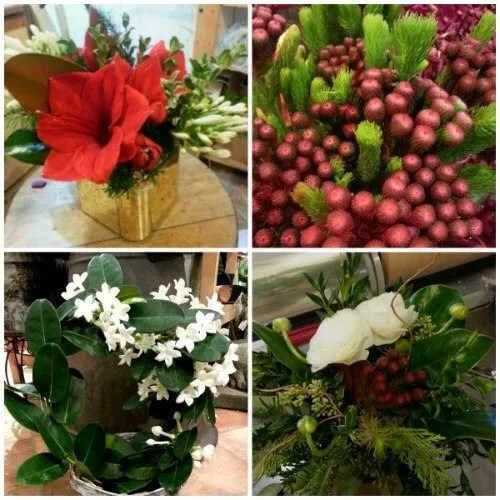 Amidst the holiday madness of this week we took some time to appreciate our favourite aspects of working as a florist during this time of year. Here are just a few current and awesome favourites!! Stephanotis: the white, waxy flowers give off an amazing scent! It has two nicknames; Madagascar Jasmine and Bridal Vale. We have these potted plants in store now, hooray! Brasilia Berries: we love using red brasilia berries to add some colour to our arrangements. They are unique, have great texture and blend well with florals and evergreens. Cotton: dried cotton in it’s natural form is another great way to add a unique look and great texture to an arrangement. Since it’s dried it is as long-lasting as long-lasting gets! Blue Hydrangea: No, they are not dyed blue. Hydrangeas will grow blue naturally when the soil is acidic. They are a perfect way to add a soft blue touch to your home during Hanukkah, or any other time of year! 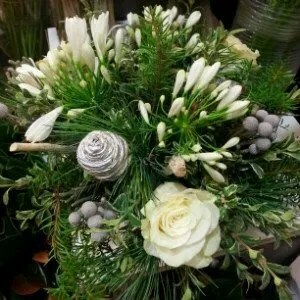 Holiday Centerpieces: We love getting creative with our custom centerpieces! This is one of the most fun parts of the holidays for us. There are a few examples in the pictures here. It’s so great to have our customers bring us their ideas and then let our creativity flow! Reminder: Today we close at 3pm. The store is closed for December 25th and 26th.